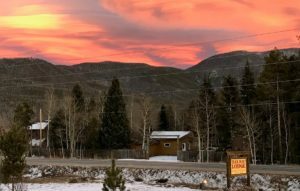 The Black Bear Lodge features 17 individual hotel rooms, a main lodge area, a outdoor heated pool, indoor hot tub and sauna, plus astounding mountain views! Guests enjoy the mountain rustic atmosphere of the main lodge room. It’s a perfect place to read, relax with a cup of hot coffee and watch for wildlife. High Speed wireless internet access available. Our outdoor heated pool is available for registered guests only, from June 1st through Labor Day, weather permitting. 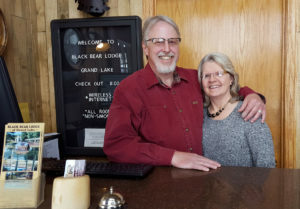 The Black Bear Lodge overlooks Rocky Mountain National Park and Shadow Mountain Lake. Nestled in the mountains, the lodge offers great views and numerous options for outdoor activities. 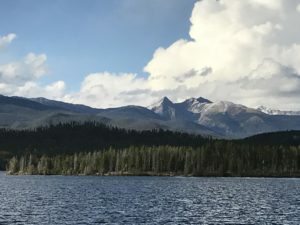 With 3 lakes and the western entrance to Rocky Mountain National Park just a few minutes away, recreation opportunities are endless. The lodge is easy to find on the main road between Grand Lake and Granby. Look for our sign along Highway 34 across from Shadow Mountain Lake. Visit the Location page for more information. ***Please contact us if you are arriving after hours.